'Pitch incursion' after late equaliser in 2-2 draw. 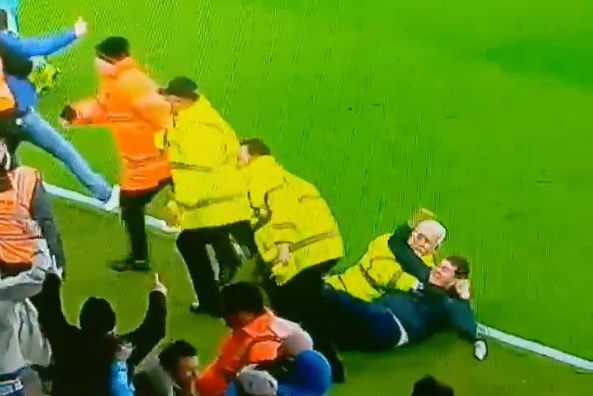 A Newcastle United supporter was seen being held down on the grass by a steward while continuing to cheer their late equaliser in a 2-2 draw at Bournemouth on Saturday. Bournemouth let two points slip at the Vitality Stadium when former player Matt Richie scored against them in the fourth minute of added time at the end of the ninety. Riotous scenes erupted in the away end with several fans making it onto the pitch in an attempt to celebrate with the players. After recent high-profile security breaches at other grounds, police and stewards were quickly upon them. One Newcastle fan could be seen with his arms still waving as he was sat on by a stadium official before being led away with a big smile on his face. Five people have reportedly been charged following the “pitch incursion”.